The junipers that fill these pages are not the landscaping shrubs that color many suburban lit. What you'll find here are, instead, the native junipers that grow across millions of acres - one of the iconic plants of the American West. 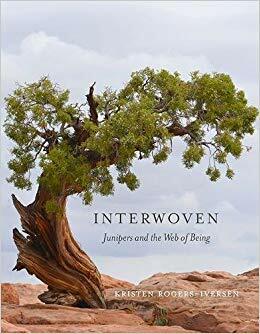 When Kristen Rogers-Iverson realized that junipers had secured a place in her consciousness, she set about exploring the stories, meanings, and multiple perspectives that interweave through the history and natural history of the tree. She discovered its prominent place in ecosystems and human lives over millennia. Junipers have warmed, sheltered, healed, and fed the humans who have lived among the trees, acquiring a supernatural mystique expressed in myths and tales. The juniper has played a key role in the American West as part of a web that is intricately connected with other plans and animals in the pinyon-juniper woodlands, overlapping much as the scalelike leaves of the Utah juniper do. Learning about juniper is one way to explore the wonders we love among; its shaggy bark and pale blue berries are as much a part of the landscape as jays or jackrabbits, sagebrush or Apache plume, and Colorado Plateau or Great Basin vistas. Learn about ghost beads and spiral grain, packrat middens and wildfire, spirituality and folklore, charcoal and gin, as well as biotic communities, tree life cycles, wilderness, and land management policies. Interwoven's exploration of junipers will enrich your appreciation for the trees and your experience of the natural world.